Bake it! Try pumpkin bread, biscuits, cookies, or scones. 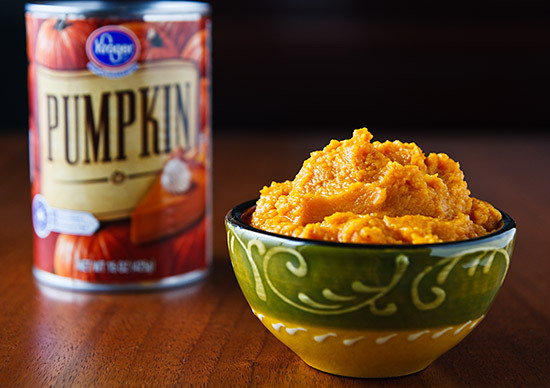 If you don’t have quite enough pumpkin leftover, don’t open another can; just top off what you have with some applesauce or mashed sweet potato. Stir a few spoonfuls into a bowl of oatmeal. Add some pumpkin pie spices (cinnamon, nutmeg, ginger, and cloves) and maybe a few raisins, and you’ve got a breakfast that will brighten up your day. Indulge in pumpkin waffles or pancakes. This recipe is good for either one, but you can also add a couple of tablespoons of pumpkin to your favorite recipe. Make ice cream. Or how about pumpkin pie wontons? Get very ambitious and make pumpkin pasta or pretzels or gnocchi. I’m thinking that pumpkin sausage looks like a winner. Make soup. Check out Toor Dal Pumpkin Soup, Hearty Pumpkin Soup, and Mexican Pumpkin Soup. Or just add it to your favorite vegetable soup or stew recipe for an instantly thick and flavorful broth. Drink it! Try a nog or a smoothie or Pumpkin Spice Hot Chocolate. Don’t feel like eating it? Treat yourself to homemade pumpkin body butter or a pumpkin facial (veganized, as necessary). Finally, if you’re just plain sick of pumpkin, you can always freeze your leftovers until inspiration strikes. Of course, I’ve got at least a dozen pumpkin recipes right here on this blog that might stimulate your appetite for pumpkin! What’s your favorite use for leftover pumpkin? In the past I’ve made pumpkin cornbread. Absolutely fantastic! I really just thought of vegan version while scrolled Facebook and found leftover turkey pie… and 3 posts below found yours! Yummy! Pumpkin is very good for dogs. It’s good for digestion, either to firm up loose stools or the other way. Sorry, I hate to bring up such a gross subject, but maybe someone can use the tip! I’ve done the pumpkin oatmeal before and that is yummy. I’ll also mix pumpkin puree with some whole wheat pasta, adding some flax oil, garlic, nutmeg and a little bit of brown sugar, and toasted walnuts on top. With a side of greens, it’s a great easy dinner! I just used my leftover pumpkin to feed to my dog who has a tummy ache (not from leftovers). If you think your dog may have a bowel obstruction, then pumpkin will help move things along. I mix it in with soy vanilla yogurt. I made a lentil, mushroom and pumpkin lasagne (recipe found here:http://www.healthbites.net/2011/05/16/homemade-lentil-mushroom-olive-and-pumpkin-lasagne/) It’s so delicous, and so packed full of nutrients, particularly when you use wholemeal lasagne sheets. Never tried pumpkin oatmeal – will definitely have to give that a go! I definitely used to mix leftover mashed yams into pancake batter for my children back in the day, so yeah, I imagine pumpkin would be great as well. These days, though, I’m more likely to mix leftover pumpkin puree in with lentil curry. Roasted, pureed, baked and blended! I don’t have a pumpkin sausage recipe, but I’ll bet I can figure one out. Let me see what I can do, and I’ll get back to you. If the dough seems too dry, add more mashed squash. You should be able to do this with any gluten sausage recipe. Thanks for getting back so quick! These look great. I’m guessing you can’t make these without gluten? I’m mildly intolerant (although I do sometime succumb to dough-based temptation…) but it’s not a huge issue. That sounds like a great idea 🙂 Thanks again. Always love your recipes and suggestions, Susan :-). There are so many things you can do with leftover pumpkin, especially since you can use it as a substitute for eggs in a lot of vegan baking. I use it in a pumpkin chocolate chip muffin recipe that I have, which is delicious, and also for soup. You can also put leftover pumpkin in oatmeal. My favourite way to use leftover pumpkin is either in a quick soup, or in pumpkin pie pancakes, both very quick, easy and delicious!